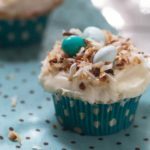 Spring holiday recipes for Easter and Passover are here to give you recipe inspiration to make a memorable holiday meal this year! 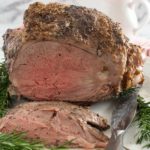 I’ve never done a “round-up” post before, but since so many of you are new to my page, I thought I’d reintroduce some of my older recipes that might inspire you as you begin to plan your Easter or Passover menus. Some dishes, obviously are not appropriate for Passover, but I’ve tried to include several that would be. Let’s start with breakfast or brunch. 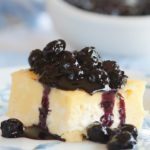 This light and fluffy, sweet cheese Blintz Souffle can be made the night before, and baked while you’re preparing the rest of the meal. 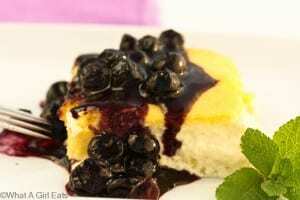 Serve it with a warm blueberry sauce. 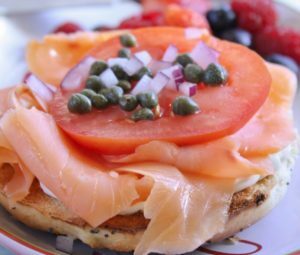 Lox and Bagels is our go-to special occasion breakfast brunch meal. The perfect spring holiday recipe… and great for Mother’s Day brunch, too. Asparagus, and Mushroom Crustless Quiche can also be made the day before and is perfect for those with gluten sensitivities. 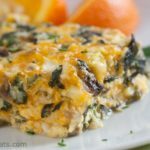 Cut into bite-sized portions make these perfect appetizers or breakfast bites. Lamb is a classic Spring/Easter dish. 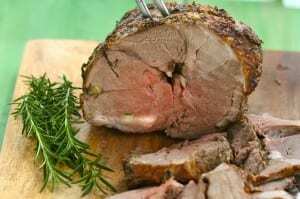 I roast it with slivers of garlic and fresh herbs and serve it with a fresh English mint sauce, Rosemary Roasted Potatoes and Baby Carrots with Fresh Dill or Mint. Crispy Greek Style Potatoes would go well with lamb too! Roast leg of lamb with fresh mint sauce. 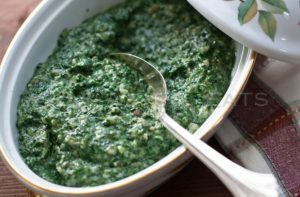 Once you’ve tried the tangy-sweet fresh mint sauce, it’s hard to go back to mint jelly. 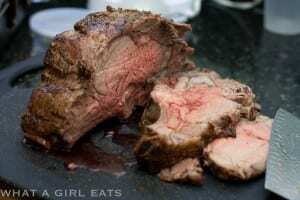 Of course, there’s Prime Rib with Creamed Horseradish. 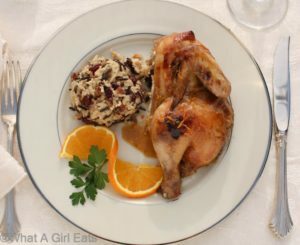 For a smaller group, Cornish Game Hen with Grand Marnier Sauce, is elegant and best of all, the birds are cooked in the crockpot! I serve the Wild Rice with Cranberries and Pecans is a great accompaniment to the hens. 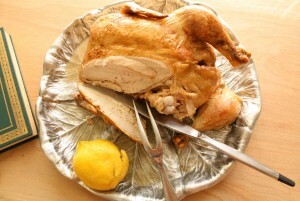 Pollo al Limone or Lemon Roasted Chicken is perfect for a Passover meal. Lawry’s Famous Creamed Spinach, Brussels Sprouts, Pommes Anna, (herb and butter potato cake). Click here for a selection of Gluten Free Side Dishes. I’ve chosen a variety of desserts, including some that are gluten free. 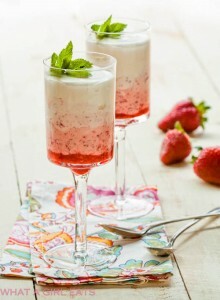 Strawberry Fool is super easy, looks elegant, requires no cooking and takes just a few minutes! It’s also naturally gluten free. 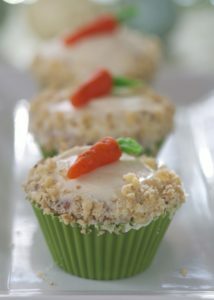 These Carrot Cake Cupcakes with Cream Cheese Frosting and Marzipan Carrots can be made either gluten free as shown, or with all-purpose flour. Lemon Bars are great for a large group as well as Summer Pudding, a classic British Dessert consisting of fresh berries and whipped cream. Orange Cream Angel Food Cake is light and fluffy and would be the perfect cake to serve a large group. 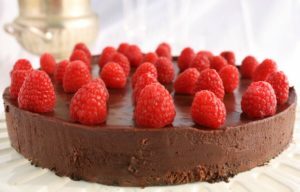 This flour less Chocolate Cake would be work well for Passover. 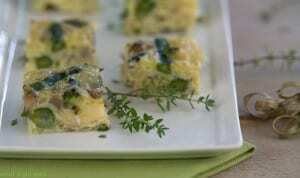 For more spring holiday recipe ideas, look under the recipe index for appetizers. If there’s something special you’re interested in, please feel free to email me or message me on Facebook and I will get back to you as soon as possible. Have a wonderful and blessed Easter or Passover.